Like most women, my body has brought no shortage of controversy in my life, having to grow up smaller than most and now going into a new stage of maturity as a woman and now dealing with the many issues that come with growing older. 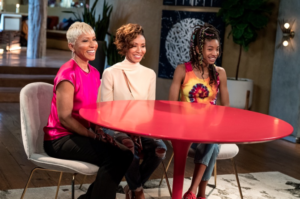 Our 3rd episode of @redtabletalk discusses body image and the often paralyzing effect it has on women’s hearts and minds. See you at the table… link in bio . And if you’ve personally struggled with any of the topics we discuss on RTT or know someone who has, we have a Facebook group who’s here to support you on whatever journey you may be on. Join us on the show page to discuss what you’re feeling, ask questions, and learn how to tackle the issues with others who may have been there before. We’re here for you and we’re listening. For those of you who don’t know, Jada has her own talk show on Facebook now called Red Table Talk and it is ONE HECK OF A WATCH. Seriously, if you haven’t checked it out, you’ve got to. It is moving and fun AND features 3 generations of women in Jada’s family!